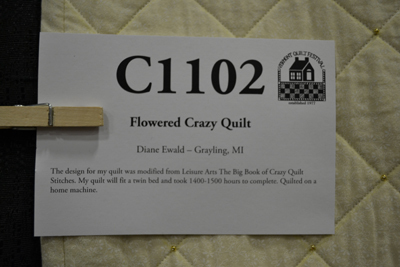 Crazy quilts are among my favorite quilts and this year at Vermont Quilt Festival, I was particularly taken with this "Flowered Crazy Quilt" by Diane Ewald. 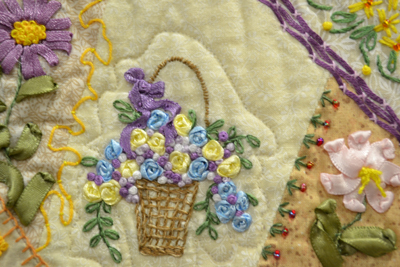 Usually crazy quilts are done with fancy sorts of materials like silks, satins, and velvets with fancy embroidery stitches to accent them. 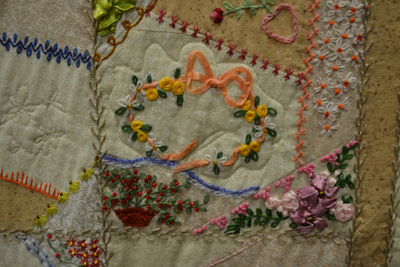 This one was done with a new twist: plain sorts of fabrics making the fancy stitching and embroidery “pop” all the more. 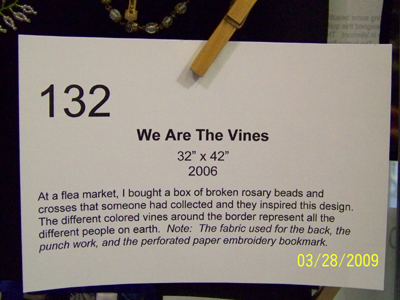 The results were striking. 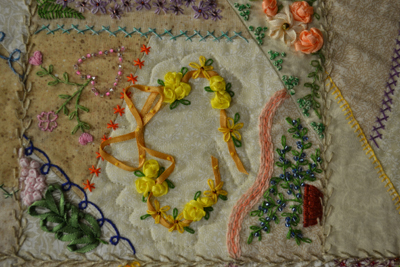 Its theme was beautifully hand-embroidered flowers using ribbon as well as embroidery thread and tastefully embellished with beads. 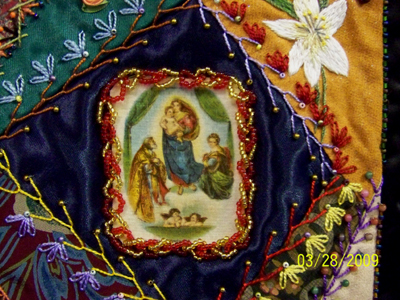 Diane Ewald's hand-work is exceptional! 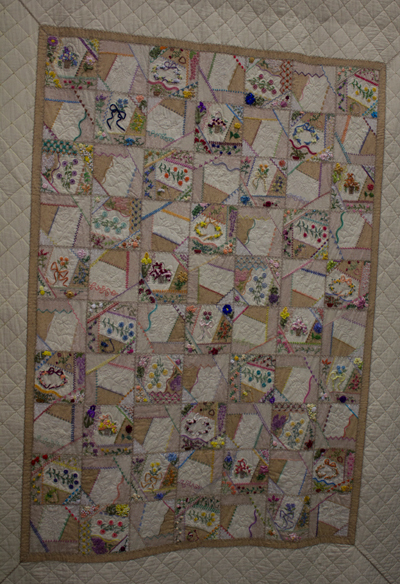 Her patchwork, rather uniform, though the blocks are turned many different ways, makes me think that the piecework was likely done with a special program on a fancy machine. 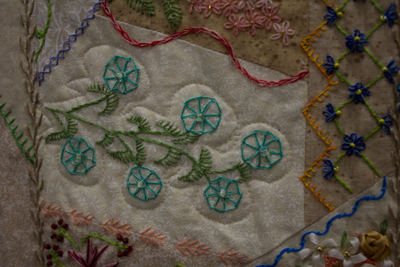 I have a Husqvarna program that does this sort of patchwork. 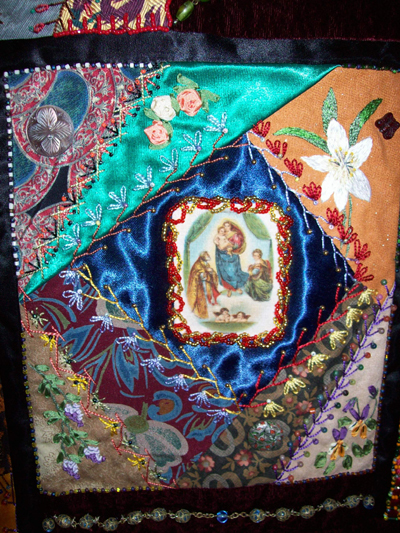 Crazy quilting, however, does not necessitate having a fancy machine, or for that matter any machine as it is the richly done hand-work that makes crazy quilts so beautiful!! 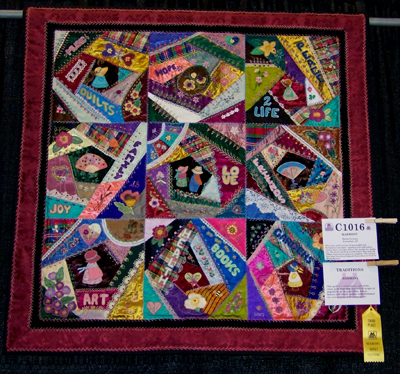 In contrast, this crazy quilt displayed at the 2008 Vermont Quilt Festival demonstrates the typical sorts of rich fabrics traditionally used in crazy quilts. 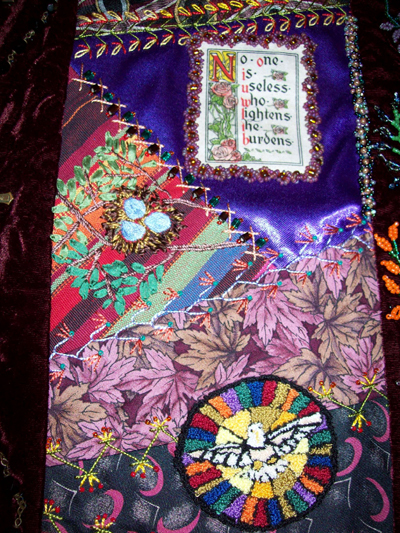 Here Sheila Groman's uses applique and embroidery in her crazy quilt, entitled "Harmony" to convey her values of love, life, hope, joy, health, family, books, art, and friendship. 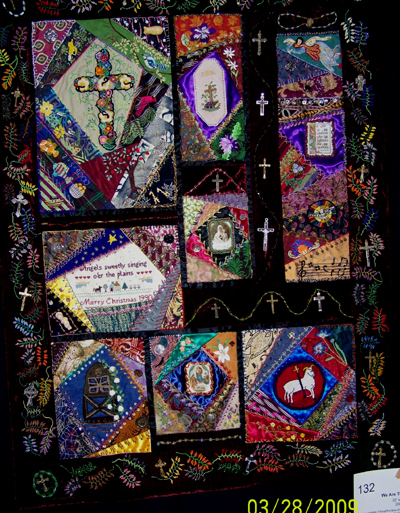 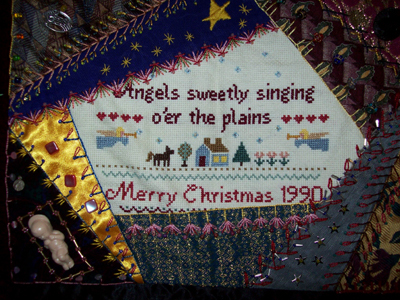 A religious themed crazy quilt displayed at the Maple leaf Quilter's Show at St. Joseph's College in West Rutland, 2009 again demonstrates the more traditional sort of crazy quilt done with fancy sorts of materials. 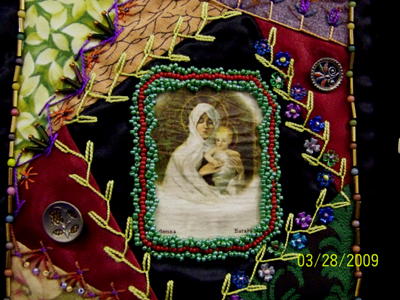 Creative punch needle embroidery, fabric photo'd prayer cards, counted-thread cross stitch, and buttons as well as rich detail work done with rosary or seed beads and crosses found at a flea market embellishes this beautiful quilt making it a unique work of art. 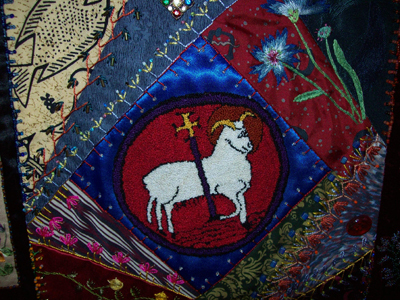 Crazy quilts never cease to amaze and intrigue me. 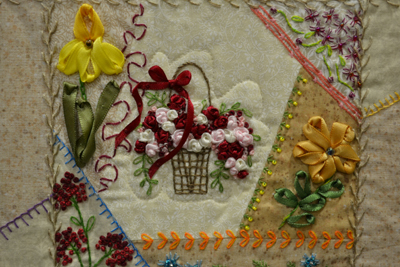 They are fun to make and each becomes a personal expression of the quilter's personality and hand sewing talents. 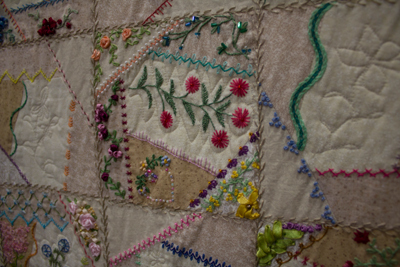 There seems to be no limit to the endless possibilities for embellishment and design.